32 ANKLE SPLINTThe ankle Brace with bi-lateral buttresses is ideal forbasketball players and other sportsmen allowing forbi-lateral protection. The medial aluminum rods and flexible lateral spirals add stabilization without limiting walking, running orsports activities. 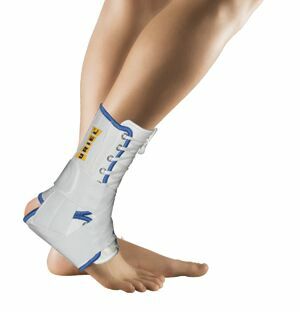 With additional support-straps, it is designed for the treatment and prevention of common or acute ankle injuries, for the treatment ofsprained or strainedtendons/ligaments, sensitive anklejoints, instability of the ankle and arthritis. Ideal for treatment following a fracture or afterplaster-cast removal. For Tendinitis, Arthritis, strained tendons, sensitiveankle joints, ankle sprains, instability of the ankle joint.